Revised, November 2018. The original version of this article appeared in Canadian Revenue Newsletter, June 2008, № 61, pp. 7-10, in BNA Topics, 2009 Q2, Vol. 66, № 2, pp. 19-28, and in The Admiral’s Log, December 2010, № 17, pp. 123-130. The two sets of provisional War Tax overprints on Admiral postage stamps (Figures 1 and 2) were issued by the Inland Revenue Department for a tax on wine that came into effect on Friday, 12 February 1915. Evidence indicates that the release of the two versions occurred in quick succession in February 1915, but the traditional date of issue for the second version has not been confirmed. There is also evidence that the printing of these stamps occurred in two separate periods. The first period was in early 1915 and the second in 1917 or early 1918. 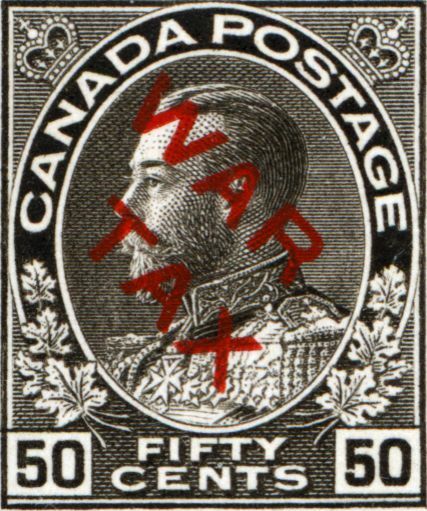 Figure 1 - First set of provisional War Tax revenue stamps – “War Tax” overprinted on 5, 20 and 50-cent Admiral postage stamps. 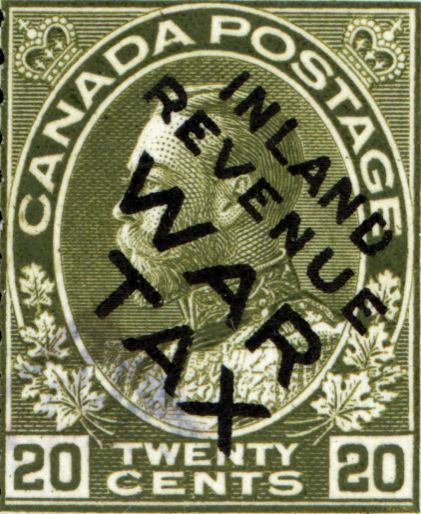 Figure 2 - Second set of provisional War Tax revenue stamps – “Inland Revenue War Tax” overprinted on 5, 20 and 50-cent Admiral postage stamps. The war tax on wine was announced by the federal Finance Minister in his budget speech sometime between 4:00 and 5:00 p.m. on Thursday, 11 February 1915, and took effect the next day †. The initial rates were 5¢ per quart for non-sparkling wine and 25¢ per pint for sparkling wine . This levy was not expected to be a major source of revenue. The Minister estimated that it would raise $440,000 . This estimate is small when compared to the excise duty collected during 1915-16 on spirits at $8.7 million, malt and beer at $2.8 million and tobacco products at $10.9 million . At the time, wine was not a popular beverage in Canada. During the 1914-1916 period, it comprised only 1.2% (one-point-two percent) by volume of all alcoholic beverages consumed in Canada . 1- The Minister [of Inland Revenue], except as here and otherwise provided, may direct stamps to be prepared for the purpose of this part of such kinds, and bearing respectively such devices, as he thinks proper. 2- The device on each stamp shall express the value thereof, that is to say, the sum at which it shall be reckoned in discharge of the obligation to affix or impress stamps under this part. 3- Notwithstanding the provisions of this section, with regard to the preparation of stamps the Minister [of Inland Revenue] may, for all purposes for which stamps are required under this part, authorize the use of postage stamps of the value required on which the words “War Tax” have been printed or impressed by direction of the Minister . In anticipation of the new tax on wine, supplies of provisional revenue stamps, in the form of overprinted postage stamps, and instructions for their use were shipped on 10 February by the Inland Revenue Department in Ottawa to its Divisional offices across the country . The Revenue Collector at each Division was responsible for the redistribution of the stamps to revenue sub-offices and postmasters within his jurisdiction. Postmasters did not automatically receive a supply; they were required to submit a requisition to the Divisional office [5, 7]. The official instructions in effect as of 12 February under the authority of the budget resolutions required the immediate stamping of all stocks of wine held by both wholesale and retail vendors. This included both bottles and casks. (At the time, vendors could stock casks of wine for resale to consumers by the bottle.) Producers of wine were not required to affix stamps until the delivery of their wines to purchasers. Importations were to be stamped before their release from Customs. Clubs were not mentioned in the original regulations [5, 6b, 9]. It was not until 16 February that an official ruling extended the tax to these stocks as well . If a stamped cask was subsequently used to fill bottles for individual sales, those bottles were to be also stamped. However, the regulations provided for a rebate of the stamps applied to the original casks in such cases. Rebates were also available for stamped wine that was exported [5, 6b, 9]. Major changes to the tax came into effect on 18 March 1915. These amendments were made by way of modified budget resolutions introduced in the House of Commons the previous evening . The first changes were reduced rates of 3¢ for pint bottles of non-sparkling wine and 13¢ for half-pint bottles of sparkling wine. However, it may have been some time before consumers benefitted from the new rates. Stocks on hand of the smaller bottles should have already been stamped at the original, higher rates. Furthermore, it appears that suitable denominations of stamps were not available until mid-April . This situation is reflected in the amount of the wine tax deposited by local Revenue Offices for the month of March 1915. All of these amounts (see Table 1) were multiples of five cents . The modified budget resolution also removed the requirement that the stamps be affixed by producers, vendors and importers to new production, stocks on hand and new importations, respectively. The application of the stamps was now to be done by a vendor only at the time of sale to a consumer. The official reason for this change was a number of complaints from importers and Customs officers that it was very inconvenient to open the many cases of foreign wine to stamp the bottles . For the first two months of the tax on wine, the only stamps that could be used were the Revenue Department’s war tax stamps. Postage stamps were not permitted to pay the tax until 15 April 1915, the effective date of the Statute passed by Parliament subsequent to the implementation of the modified budget resolutions. The provision in the preliminary legislation that allowed the Minister of Inland Revenue to direct the production and use of postage stamps overprinted “War Tax” was not included in the final version of the statute [5, 14]. The Inland Revenue Department objected to the use of postage stamps to pay Inland Revenue taxes in general ‡, but once overprinted the provisional stamps were no longer “postage stamps” . The traditional dates reported in philatelic publications for the issue of the provisional War Tax stamps are 12 February 1915, for the “War Tax” overprints in Figure 1 and 13 February for the “Inland Revenue War Tax” overprints in Figure 2. The earliest such reference known to this writer is an article published in April 1916 . An earlier article of March-April 1915, described the second set as having been issued “shortly after” the first set . It appears that a quick change in the provisional stamps did indeed occur, although the exact date for the release of the second issue is at yet undetermined by this writer. Newspaper reports of 12 and 13 February from Montreal and Toronto describe or illustrate only the first version of the provisionals (Figure 1). Reports from other cities that received their initial supply at later dates likewise mention only this version [6, 8, 17]. As for the quantities included in the first shipment of the stamps, the Toronto Daily Star of 11 February and the Calgary Herald of 18 February each reported that a combined total of 15,000 of all three denominations had been received at the respective Divisional office [7e, 18]. We have been in communication with Mr. Ross of the Finance Department today in regard to changing a clause in the Act in regard to the issuing of war stamps by this [Post Office] Department . . .
. . . Mr. Ross has refused to make the change, and on our bringing the matter up again this afternoon he states that to do so would be incompatible with the clause that gives the Minister of Inland Revenue power to use [overprinted] postage stamps instead of a special stamp of their own. In other words, a regulation to manipulate the stamps of the Post Office Department, although issuing postage stamps is our business, would be doing a wrong to the Minister of Inland Revenue, who should have no power to issue postage stamps at all. This is the first intimation to this Department that postage stamps have been purchased from the [American] Bank Note Co. for this purpose until the Inland Revenue can get another stamp, and I am afraid it is going to lead to serious complications with this Department. The mere fact that a postage stamp is marked ‘war tax’ does not prevent its being considered a postage stamp . . . . If these are used to any great extent for postage there will be no possible way of accounting for them, and the revenue that should come to this Department will go to the Inland Revenue Department for carrying mail matter, to the extent that these stamps may be used for postage. It will never be possible to make the average country Postmaster understand the difference between the two classes of stamps. The fact that they are postage stamps and may be put on parcels, letters or legal papers will mean that they will be used by the general public, and we will be out that much revenue, and it will be a most difficult and irritating thing with the public, I am afraid. What is more, the use of postage stamps by any other Department than the Post Office Department tends to destroy the respect which the public have for postage stamps. If you remember, this is one reason we had to prevent the use of stamps of any kind issued by the Red Cross Society, etc., on the front of letters, as the letters were constantly getting through to their destination without stamps. This is exactly what may take place under this arrangement made with the Inland Revenue Department. So far as this Department is concerned, all such stamps that may be used for postage will be unaccounted for, and the revenue that should come to this Department will go to the Inland Revenue Department. Moreover, philatelists all over the world will be purchasing these stamps as postage stamps, and this Department will have the reputation of having issued these stamps – as the Inland Revenue Department will not be known in the matter – when no such stamps have been issued by us. I understand the Inland Revenue Department is only going to use these stamps temporarily; the question arises, what will be done with the stamps that have not been used, when their new stamps are printed . . .
. . . I have deemed it well to bring the matter to your attention and ascertain if some conference could not take place to arrange so that, even if the right to issue [overprinted postage] stamps is not taken from the Inland Revenue Department, we might be given the power to make regulations that will not cause friction between the [Post Office] Department and the public, and carry out the intention of the Government as expressed the other evening. As you have not mentioned the matter to me, I have assumed that it is the first time it has been brought to your attention, and as I understand 350,000 high-value postage stamps have been issued to the Inland Revenue Department and will be sent throughout the country at once, I deemed it wise that this should be brought to your attention without delay . In 1915 there were thirty-two operational Inland Revenue Divisions . Given the reported initial shipments of 15,000 stamps to each of the Toronto and Calgary Divisions, and allowing for smaller initial shipments to smaller or otherwise low-demand †† Divisions, the figure of 350,000 stamps quoted above is reasonable for the first delivery by the American Bank Note Company, Ottawa (ABN) ‡‡. The protest of the Post Office was most certainly the impetus for the change in the provisional overprint to the more explicit “Inland Revenue War Tax” (Figure 2). The earliest newspaper report of the revised overprint known to this writer appeared in the Ottawa Citizen of 18 February 1915 [7d]. However, it is possible that the revised stamps were released at an earlier date. Given the letter of 11 February quoted above and the “conference” of interested parties that it requested, it is possible that the decision to alter the overprint was made and communicated to ABN as early as Friday, 12 February. This would have permitted the revised overprint to have been issued by 18 February, possibly as soon as the 16 February date suggested by Marler . Newspaper reports indicate that ABN had been given only a short time to prepare the initial supply of the provisionals and that this supply had been inadequate to meet the demand. Additional quantities of the stamps were delivered to local Revenue Offices within days of the 12 February imposition of the tax [7a, 10b, 18, 22]. It is plausible that these additional supplies would have soon appeared with the revised overprint as the supply of the original overprint was depleted. These figures represent a weighted average value of $0.082896 per stamp and the following distribution for the denominations: 85% were 5-cent, 11.5% were 20-cent and 3.5% were 50-cent stamps. If these figures are taken as representative of the country as a whole, then an estimate can be made of the total number of provisional stamps of both versions sold during February and March of 1915. The Auditor General’s Report and the Inland Revenue Report for the fiscal year ended 31 March 1915, both give $98,056.95 as the total war tax revenue for that year [13, 23]. Since the levy on wine was the only war tax being paid into the Revenue Department prior to mid-April 1915, the amount collected for 1914-15 represented only stamps sold for wine . The application of the Toronto figures of 17 February to this total produces the approximate quantity of 1,180,000 provisional stamps, of which 1,000,000 were 5-cent stamps, 140,000 were 20-cent and 40,000 were 50-cent, in rounded figures. The applicability of the Toronto figures to the entire county can be tested by a comparison to an official estimate of the annual revenue from the tax on wine. This was provided on 18 March 1915 by the Minister of Finance in response to a question in the House of Commons. His estimate was $180,000 from non-sparkling wine and $260,000 from sparkling wine, a split of 41% to 59% . Non-sparkling wine comprised 21,656 bottles at 5 cents each for a total of $1082 or 44.4% of total revenue. Sparkling wine comprised 3,378 bottles at 25 cents each for a total of $844.50, and 1,026 bottles at 50 cents each for a total of $513, yielding a combined total of $1357.50 or 55.6% of total revenue. The percentages based on the Toronto sales to 17 February are comparable to the percentages given by the Minister on 18 March. It is surmised that he based his figures on national sales of the stamps. Sales of the provisionals after March 1915 cannot be determined from published government data. By 13 April 1915, the amount collected from the sale of War Tax stamps included other denominations in the regular issue. These were now being sold for other purposes such as the tax on commercial paper . The end of the provisional period began on, or shortly before, 13 April 1915. By that date, ABN had submitted its invoice to the Revenue Department for the first delivery of the regular 5-cent War Tax stamp, and this stamp could be purchased at one or more local Revenue Offices [12a, b, 24]. Figure 3 - Extract from the Auditor General’s Report for the Fiscal Year ended 31 March 1918, showing a payment to the American Bank Note Company by the Inland Revenue Department for “postage surtax” stamps under the heading of ‘Excise: War Tax Contingencies’. In the absence of any other explanation, the last of the above items appears to have been a payment for a late printing of the War Tax provisionals. The actual printing might have been done prior to April 1917, and details of the stamps included can be only surmised from extant examples. It is obvious that the 5-cent stamps printed from Plates 9 and 10 were included. However, the situation regarding the 20 and 50-cent stamps is not at all clear. Known plate numbers of overprinted stamps alone provide no evidence either for or against a late printing for these stamps. A study of the “PO” (printing order) numbers found in the margins of Admiral postage stamps may shed further light on this mystery . The motivation for the late printing of the provisional War Tax stamps may have been a demand for the stamps by philatelists. Philatelic publications from the 1915-16 period reported that most of the first provisionals were used on wine before many philatelists were even aware of their existence. This was especially true for the 5-cent denomination, which was reported by these publications to have been the first stamp to be sold out and replaced by the second provisional overprint. For collectors of the day, the 5-cent denomination overprinted “War Tax” was a difficult stamp to acquire and in much demand [15, 16, 27]. 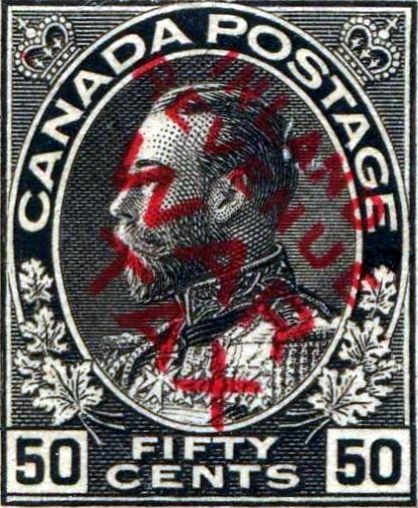 Finally, it must be emphasized that the Canadian Post Office Department had absolutely nothing to do with the overprinting of the 5, 20 and 50-cent postage stamps for the war tax on wine. The Post Office did not supply the stamps to the Inland Revenue Department, and had no control over their production, distribution or application, other than to prohibit their use on postal matter. The Inland Revenue Department was entirely responsible for the supply and cost of its own stamps of both the provisional and the regular issues. † The preliminary legislation as distributed to Inland Revenue officers gave 11 February as the implementation date, but this was overridden by the Budget Resolutions that set the date at 12 February. ‡ This objection by the Inland Revenue Department arose in large part from the Post Office policy of paying many postmasters by means of a commission on their sales of postage stamps. This commission ranged from 15% to 50%, on a graduated scale based on the postmaster’s annual revenue. By comparison, the commission paid to postmasters and private vendors on the sale of Inland Revenue stamps was set in 1915 at only 1%. As a result, postmasters paid by commission actively promoted the use of postage stamps to pay Inland Revenue taxes. This practice was encouraged by the Post Office Department. In early 1917, the Post Office prohibited the sale of Inland Revenue stamps by postmasters [28, 29]. †† Counties and municipalities could declare prohibitions on the sale of beverage alcohol within their boundaries, with exemptions for medical and other approved purposes. The Province of Prince Edward Island was also under such a prohibition. ‡‡ ABN is treated here as having applied the overprint to its own stamps since this writer has not discovered any evidence of another printer. ††† The annual Auditor General Reports consistently gave the quantities of both Post Office and Inland Revenue stamps as exact figures priced at an amount per 1,000 stamps (e.g., "49,801,000 at 16c. per M" (M from French "mille" for 1,000)). Given the small number of stamps involved, 5,000, and the fact that they had been replaced with normal revenue stamps, it is surmised that the stamps were produced to satisfy a special request rather than for normal use. The Revenue Department did not have a philatelic service until the 1940s. - Canada, Debates of the House of Commons , 1915, pp. 85-94. - Canada Year Book , 1920, p. 561. - “War Tax Stamps Placed on Sale,” Montreal Gazette , Feb. 12th, 1915, p. 4.
a- “Collecting Wine Tax from Feb. 11,” Winnipeg Tribune , Feb. 13th, 1915 (evening), p. 1.
b- “Wheels Work Smoothly,” Toronto Daily Star , Feb. 12th, 1915 (evening), p. 2.
a- “Liquor Men Pay in $542,” Toronto Daily Star , Feb. 15th, 1915 (evening), p. 8.
b- “Must Have War Stamps,” Vancouver Province , Feb. 20th, 1915 (evening), p. 22.
c- “No Stamps Yet Received,” Edmonton Bulletin , Feb. 18th, 1915 (morning), p. 6.
d- “Stamping Wine Bottles,” Ottawa Citizen , Feb. 18th, 1915 (evening), p. 1.
e- “War Tax Imposed,” Toronto Daily Star , Feb. 11th, 1915 (evening), p. 1.
f- Fox, J.D., “War Tax on Wine,” Montreal Gazette , Feb. 15th, 1915, p. 9.
a- “25 Cent Stamp Tax Effective at Once on Sparkling Wines,” Saint John Telegraph , Feb. 13th, 1915 (evening), p. 12.
b- “Given Instructions as to Stamp Duties,” Vancouver Sun , Feb. 18th, 1915 (morning), p. 2.
c- “Local Opinions on the Tariff Changes,” Hamilton Spectator , Feb. 12th, 1915 (evening), p. 1.
d- “New Rates Operative in Tariff Schedule,” Victoria Times , Feb. 18th, 1915 (evening), p. 10.
e- “New Tax on Wines,” Edmonton Bulletin , Feb. 19th, 1915 (morning), p. 2.
f- “New War Tax on Liquor,” Edmonton Journal , Feb. 19th, 1915 (evening), p. 2.
g- “Stringent Rules on War Taxes,” Vancouver Province , Feb. 17th, 1915 (evening), p. 14.
h- “War Stamps Here,” Calgary Herald , Feb. 16th, 1915 (evening), p. 12.
i- “War Stamps Here,” Saint John Globe , Feb. 12th, 1915 (evening), p. 9.
j- “War-Tax Stamps for Wines have been Issued,” Berlin Telegraph , Feb. 16th, 1915 (evening), p. 5.
a- Freeland, A., “Timbres de la Taxe de Guerre sur les Vins,” Ottawa Le Droit , Feb. 13th, 1915, p. 3.
b- Freeland, A., “War Tax Stamps on Wines,” Ottawa Journal , Feb. 13th, 1915 (evening), p. 4.
a- “City Briefs . . . Stocked Wines Are Hit,” Winnipeg Tribune , Feb. 16th, 1915 (evening), p. 5.
b- “Liquor Men Paying Up,” Toronto Daily Star , Feb. 17th, 1915, p. 4.
c- “Revenue Tax Started.” Edmonton Journal , Feb. 16th, 1915 (evening), p. 1.
d- “Tax Applies to Wine in Stock,” Manitoba Free Press , Feb. 16th, 1915 (morning), p. 18.
a- “Government Makes Changes in Tariff,” Toronto Daily Star , Mar. 18th, 1915, p. 5.
b- “Government Makes Tariff Concessions,” Toronto Globe , Mar. 18th, 1915, pp. 1, 5.
c- Canada, Debates of the House of Commons , 1915, pp. 1175-1177, 1207-1208, 1211-1213.
a- “Cloud of War Stamps Hastens Business Men,” Toronto Globe , Apr. 14th, 1915, p. 8.
b- “Pay War Taxes at Midnight To-night,” Toronto Daily Star , Apr. 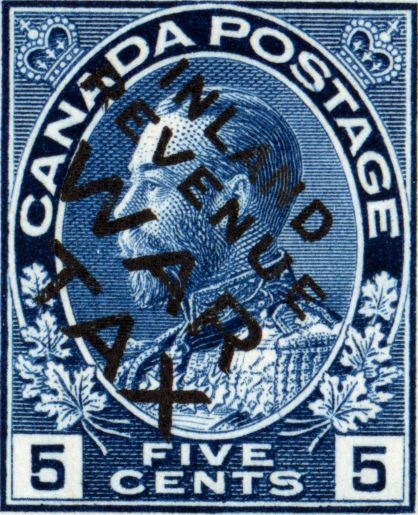 14th, 1915, p. 4.
c- Ryan, C.D., “Issue Dates for Three Series of Canada’s War and Excise Tax Stamps,” Canadian Revenue Newsletter , June 2007, № 57, pp. 2–3; Addendum, Sept. 2007, № 58, p. 6. - Canada, Inland Revenue Report for the Year ended March 31st, 1915, Part 1 – Excise, pp. 30-31, Sessional Papers , 1916, 6 Geo. V, Paper № 12.
a- Canada, Debates of the House of Commons , 1915, p. 1411.
b- Canada, Statutes , 1915, 5 Geo. V, Chapter 8, Section 19. - Perry, G., “Canadian War Tax Stamps,” Mekeel’s Weekly Stamp News , Apr. 29th, 1916, Vol. 30, № 18, pp. 165-167. 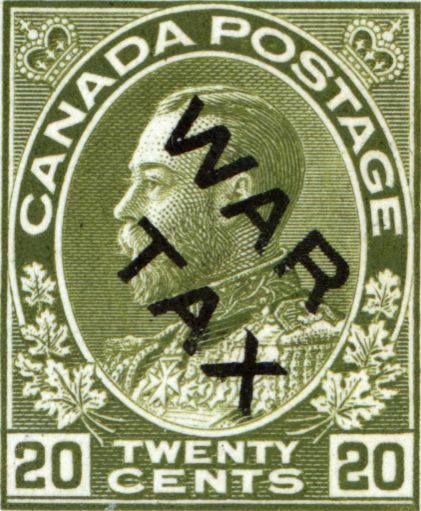 - “Canadian War Tax Stamps Issued,” The Stamp Journal (Camden, New Jersey), Mar-Apr 1915, Vol. 8, № 3-4, pp. 83-84, 99.
a- “How the New War Stamps will Look,” Toronto Globe , Feb. 13th, 1915, p. 8.
b- “Stamps for the War Tax,” Edmonton Journal , Feb. 19th, 1915, p. 1.
c- “The New War Stamps.” Toronto Telegram , Feb. 12th, 1915, p. 18. - “War Tax Stamps Supply Limited,” Calgary Herald , Feb. 18th, 1915 (evening), p. 3. - Coulter, R.M., Deputy Postmaster General, Letter of February 11th, 1915, to T.C. Casgrain, Postmaster General, National Archives of Canada, Records of the Post Office Department, RG 3, Vol. 641, File 746-25. - Canada, Inland Revenue Report for the Year ended March 31st, 1915, Sessional Papers , 1916, 6 Geo. V, Paper № 12. - Marler, G.C., The Admiral Issue of Canada . State College, PA: American Philatelic Society, 1982. - “Wine Vault Company Buys First Stamps,” Ottawa Citizen , Feb. 12th, 1915 (evening), p. 1. - Canada, Auditor General’s Report for the Year ended Mar. 31st, 1915, Sessional Papers , 1916, 6 Geo. V, Paper № 1, Part I, p. 47. - Taylor, G.W., Assistant Deputy Minister of Inland Revenue, Letter of April 13th, 1915, to T.C. Boville, National Archives, Records of the Finance Department, RG 19, Vol. 445, File 111-2-38. - Canada, Auditor General’s Report for the Year ended Mar. 31st, 1918, Sessional Papers , 1919, 9 Geo. V, Paper № 1, Part I, p. 20. - Leopold Beaudet, Editor of The Admiral’s Log (the newsletter of the Admiral Study Group of BNAPS), personal communication. 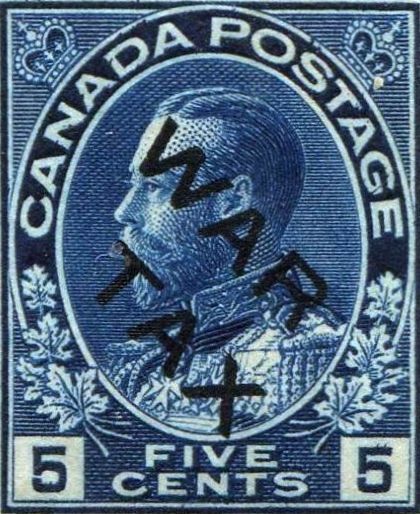 a- “Canada War Tax Stamps,” The Stamp Journal (Camden, New Jersey), Feb. 1915, Vol. 8, № 2, p. 57.
b- “Collectors After the War Tax Stamp: One Inland Revenue Issue has been Sold Out,” The Collectors’ Journal of Chicago , 1915, Vol. 6, pp. 113-114.
a- Vincent, J.U., Deputy Minister of Inland Revenue, Letter of 16 February 1917 to TC Boville, Deputy Minister of Finance, LAC, RG 19, Vol. 259, File 101-53-2 Vol. I.
b- Coulter, R.M., Circular to Postmasters, 30 April 1915, LAC, RG 3, Vol. 641, File 746-25.
a- Canada, Report of the Postmaster General for the Year ended March 31, 1918, Sessional Papers , 1919, 9 Geo. V, Paper № 24, p. 9.
c- Coulter, R.M. (unsigned), Deputy Postmaster General, Draft Letter of 15 June 1915, to R. Trites, Secretary, Westmoreland County Conservative Association, LAC, RG 3-C-1, Vol. 641, File 74625.
d- Monthly Supplement to Canadian Official Postal Guide , March 1917, p. 5. Christopher D. Ryan is a noted researcher of BNA Revenue stamps. He has edited the Canadian Revenue Newsletter , the newsletter of the Canadian Revenue Study Group, since 1995, and was awarded the John Siverts Award for best BNAPS Study Group newsletter in 1998. He has also published extensively on the subject, and was given the Vincent G. Greene Award for best article in BNA Topics in 1994, 2000, 2005, and 2011. In 2011, he received the Research Medal of The Revenue Society. In 2013, he published the Catalogue of the Federal Tobacco Stamps of Canada which is available online in PDF format. His "An Introduction to Canadian Revenue Stamps" is posted on the BNAPS website.